"I am firmly convinced that Islam is the single greatest challenge the Church will face before the return of Jesus, yet most are still either asleep or in denial." 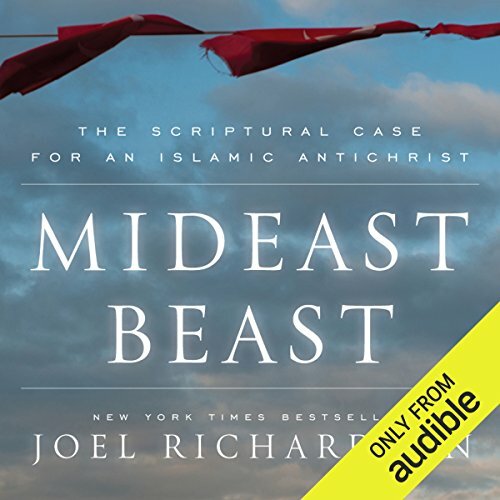 Through a highly scholarly, theologically grounded, yet simple presentation, Richardson thoroughly corrects the objections of critics, establishing beyond a doubt, the Biblical case for an Islamic Antichrist. With large segments of the Christian missionary movement embracing a heretical method of outreach to Muslims known as "Chrislam" or "The Insider Movement", Mideast Beast cuts to the core of the matter, revealing the true nature and origins of Islam. What about Psalm 83 & Isaiah 17? Is Gog of Magog from Russia, or somewhere else? What role does the nation of Turkey play? What other scholars and commentators support this view? Will Antichrist really claim to be YHVH God Almighty? Why the Antichrist will not be a humanist. What's comes next in the Middle East? What the Church must do now. ©2012 Joel Richardson (P)2014 Audible Inc. This book would be good for anyone wanting to get their teeth into the Old Testament prophets and the book of Revelation. It makes sense of many texts which baffle proponents of the popular European based Antichrist theory. If you think you can never make sense of the end times and the Scriptures that deal with the end, Joel supplies a very helpful framework to begin to deal with them. The narrator is excellent, and the book is one you will want to listen to again and again. As well as the sources referred to in the book. It is a masterful work taking time to give the full opposing view. Every Christian should hear it. This is a book for those wanting to know more about the modern debate over Biblical end-times prophecy. Before this book I had already read Richardson’s earlier book GOD’S WAR ON TERROR, so I knew full well what the title implied. This book is a more focused treatment on the idea that the Antichrist of Orthodox Premillennial Christian Eschatology will be of Middle-East origin. I think he makes a good case. Richardson here explains cogently how the conventional idea of an Antichrist of Roman-European origin does not hold up to close scrutiny. The idea that Ezekiel’s Gog and Magog are not Russia—as many Premillennial divines have traditionally taught—but are demonstrably proven to be the Antichrist and Asia-Minor (modern-day Turkey) is well developed by Richardson. He cites the many related scripture references that make it clear that Russia is not a satisfactory match for Gog and Magog. His explanation of how the Islamic Caliphate, headed by the Turks, neatly fulfills all the scriptural requirements for the fourth kingdom of Daniel chapter 2 and the fourth beast of Daniel chapter 7—and that Rome patently does not. The book is narrated by Joe Geoffery who reads the book in an inflectionless monotone that is sleep-inducing. This is a non-fiction book, so there are frequent lengthy quotations of sections excerpted from related books. When shifting from Richardson’s text to the quotation Geoffery offers no audible cue to help the listener mark the transition. He does not even grant the listener an extra pause, but maintains the same pace that he gives for breaks from one paragraph to another. In the main, Joe Geoffery is more of an obstacle to understanding the text than he is an enhancement. To his credit, he does have precise diction so it is easy to understand the words he is saying. What did you love best about Mideast Beast? I think this entire book is fascinating, even amazing, but what I really liked here is the introduction in which the author provides rules for interpreting the eschatology of the Bible. I would go one step further and say they are good rules for interpreting the Bible generally. Though we love our fellow human beings, and that love includes bringing about a caution when observing errant ways, too often we are too lazy to do proper research. Joel does the heavy lifting here, rightly dividing the Word of Truth and providing a completely unbiased tour of Islamic literature. From this exhaustive work, one can make an "informed" choice. And, that is what God wants us all to do: choose ("... ye this day whom ye will serve.") Every research of this nature must begin with honest prayer - prayer to God for discernment. With that premise, one can immerse oneself in the details, testimonies, and published literature from credible source, archeology and science. I pray that all who read this will find God's purpose and that the incredible, perfectly crafted integrated messaging system (of over 66 books by over 40 authors encompassing over 4,000 years) becomes real for each reader! What a tremendous consideration - God told Daniel He'd saved something for that last generation...maybe we're seeing it play out? What would happen if the players Christians have been taught to watch as early warning signs for the end times (for the past 30 years...) aren't exactly the one's God planned to use...? Although I have believed for a long time that antichrist will come from Selucia, the author has provided me with a much stronger fram.e of reference than I had simply based on my studies. Thank you brother Joel. I have come away with a much deeper concern for Muslim people. Joel may be right on here. A good listen. Never dull. I think I would have preferred a more upbeat voice for this but really the narrator was fine and I enjoyed the pace. Takes many pieces scattered across the writings and organizes them into coherent concepts. Allows us to see clearly our role as Christians, challenges us to make tough biblical choices which one may feel totally unqualified to make. What did you like most about Mideast Beast? Have you listened to any of Joe Geoffrey’s other performances? How does this one compare? Authors position gave me impression of being a little pretentious & patronizing. He would often say the revised Roman empire position was "impossible" & only his view was as a result of a "careful study of relevant passages" & history "perfectly" fit his view. Apart from that was interesting.